Conveniently located just minutes from the Sunshine Coast's Airport, Novotel Twin Waters Resort offers luxury guest rooms and suites just a short stroll from the beach. The resort also offers an amazing range of facilities including centrepiece lagoon, championship golf course and much more. Enjoying spectacular coastal views, Ramada by Wyndham Marcoola Beach offers spacious self-catering accommodation centrally located close to the Sunshine Coast's most popular tourist attractions and activities. Just 75 metres from the beach, the resort is also home to an outstanding range of onsite leisure facilities. Located in the heart of Marcoola, Sand Dunes Resort offers spacious accommodation just 150m from Marcoola Beach. Featuring a low level architectural style, the resort is home to a great range of onsite facilities and is just a short stroll from a variety of local shopping and dining options. Conveniently situated within 5 minutes of the Sunshine Coast Airport, the resort is also just 10km from a variety of excellent beaches and is within a short drive of a number of popular local attractions including Australia Zoo. 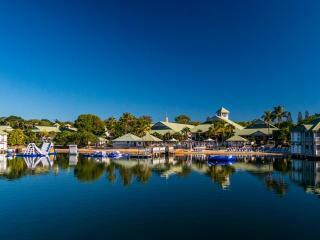 Set amid a saltwater lagoon and popular patrolled surf beach, The Sebel Twin Waters offer a unique beachside escape. Opposite the Novotel, The Sebel Twin Waters enjoys access to the resort's fantastic facilities while still offering stylish self-contained apartments of its own.